You can use the Company Info page to provide information about your company, enter global settings for your application, enable notifications, setup integration with third-party software, and other. The Company Settings tab includes general settings for various application features. The Time Zone setting is used to calculate the local time throughout the Back Office application. Note that such entities as teams, devices, and repair locations may have their own time zone settings; however, if they don’t, then company time zone setting is used by default. Back Office type enables creating invoices in the Back Office application only. Device type enables creating invoices on mobile device only. Mixed type enables creating invoices both in the Back Office application and on mobile device. The Device History setting determines a period of time within which the data is kept on mobile devices. The minimum period is one month and the maximum period is one year. When selecting a period you should take into account that the longer the period is, the larger is the database file on mobile device, and consequently the more processing resources it takes on mobile device. Note that while out-of-period data is automatically removed from mobile devices, all the data remains available in the Back Office application. The Retail Clients History setting defines a period within which new retail clients are shown in the list of customers on mobile device. The minimum period is 15 days, the maximum period is 90 days. The Duplicates by VIN History setting defines a period of time within which invoices with the same VIN are reported. The minimum period is one month and the maximum period is one year. PO/RO type adds the PO/RO option to the list of available invoice payment types. Cash/Check type adds the Cash/Check option to the list of available invoice payment types. Credit Card type adds the Credit Card option to the list of available invoice payment types. 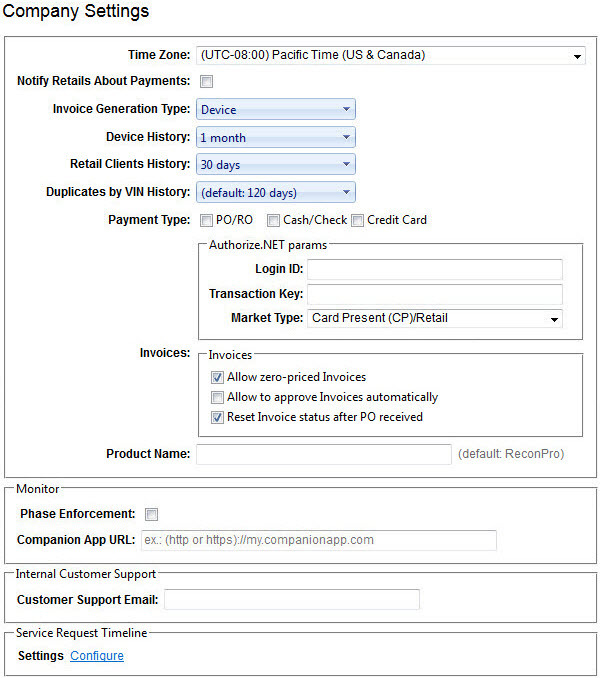 The Authorize.NET params setting is used for setting up an Internet connection between the Back Office application and the payment gateway (e-commerce application service provider service that authorizes credit card payments). The Login ID and the Transaction Key parameters provide the authentication required for access to the payment gateway. The Market Type parameter defines the way of providing the credit card data: E-commerce - through a website or software application, MOTO - through a phone ordering service or an offline form, and Retail – through a magnetic track reader. Allow Zero-Priced Invoices allows creating zero value work orders from which you can generate invoices with zero value. Allow to approve invoices automatically allows approving invoices automatically if they are in the New status and they have not been modified in the last 60 minutes. Reset invoice status after PO received turns on automatic resetting of invoice status from Exported to Approved when invoice PO# is entered. The Product Name setting defines the Back Office application name that you see in the browser tab. The default product name is ReconPro, so if you want you can change it to your company name or any other appropriate name that you can imagine. The Phase Enforcement option defines a default setting for repair locations that you create. If the Phase Enforcement check box is selected, it will be also selected for each new repair location, and vice versa. The Companion App URL setting defines whether users will log in to and work with the Companion App website instead of the Back Office website. The Internal Customer Support section has the Customer Support Email setting which indicates an email address that is used for sending support requests to AMT customer support department. The Service Request Timeline section specifies what data should be logged and then shown on the Service Request Timeline page. The Company Profile tab includes the company information that is automatically added to the header of various printouts and reports. In the Logo box, click Browse; in the File Upload dialog box, browse to the logo image file, click it, and then click Open. 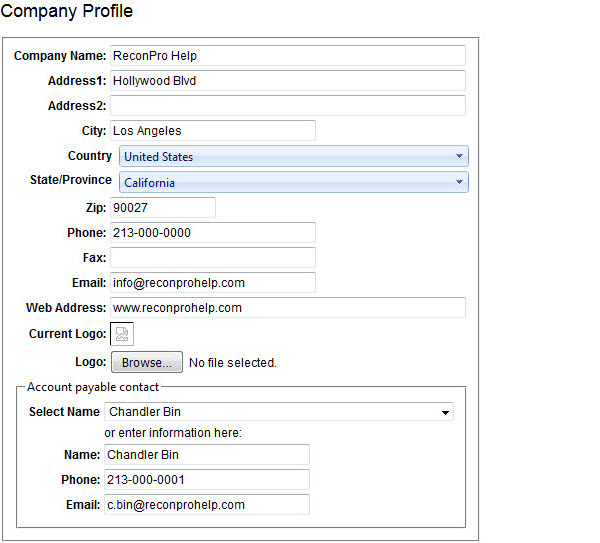 The Account payable contact setting is used mainly for generating data for estimate management systems (EMS). You can either select the contact from the user list or enter contact’s name, phone and email. The Notification Settings tab includes SMTP settings and Twilio settings that enable delivery of notifications by email and SMS. 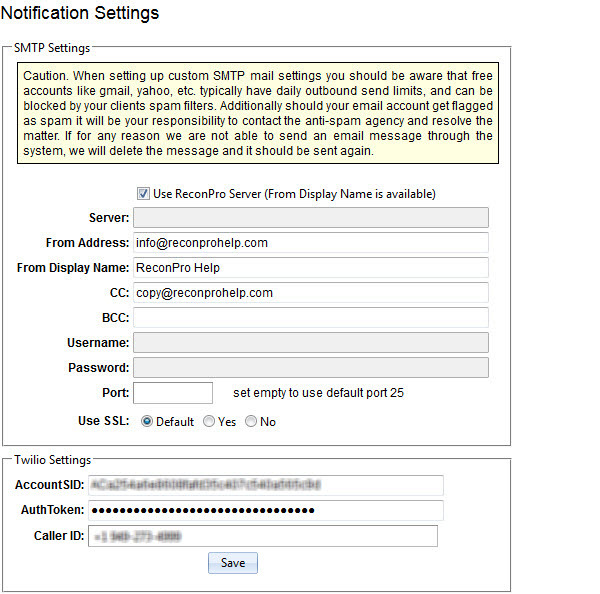 The SMTP settings are used for sending email notifications. For that purpose you can set up the default ReconPro Server or a custom mail server used by your company (including free mail servers such as Gmail or Yahoo Mail). Important! If you use smtp.gmail.com as your mail server, you need to turn on the Allow less secure apps setting in your Gmail account. Do not clear the Use ReconPro Server check box and enter appropriate SMTP settings (except for the Server, the Username, and the Password boxes). Clear the Use ReconPro Server check box and enter appropriate settings. Server is a mail server address which usually has the "smtp.domain.com" or "mail.domain.com" format (ex. : smtp.gmail.com). From Address is your company email address from which you want the email notifications to be sent. From Display Name is the name of your company or your company contact that you want to be shown in the From field of the email message. CC is an email address to which you may want to send the copies of email notifications. BCC is another email address to which you may want to send the copies of email notifications. Username is your mail account identifier which is usually written in a one-word name format or email address format (ex. : yourname@gmail.com). Password is a password for your mail account. Port is the number of the port used for SMTP connection. You can leave the Port box empty to use the default port 25, or you can type the port number that you want (ex. : port 587 for Gmail SMTP server). Use SSL means using Secure Socket Layer to establish secure SMTP communication. If you select the Default option, using SSL will depend on the configuration file of the Back Office application, otherwise you can select Yes to use SSL, or No not to use SSL. AccountSID acts as a username (a long string like "APa4983020a0b29fb5db1b1dc68e322fbe"). AuthToken acts as a password. CallerID is an SMS-enabled phone number.